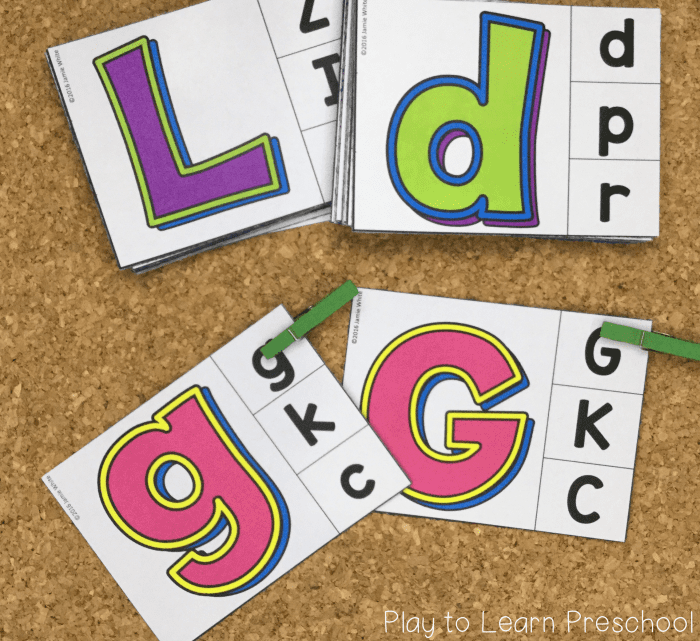 One of the main goals of preschool literacy instruction is to teach young children the alphabet. For some children, this comes very easily and naturally but for many others, it takes a lot of time, energy, and practice. It is tempting to think that sit-down practice with paper and pencil is the best way for our preschoolers to practice. Don’t do it! There are so many better ways… ways that incorporate movement, sensory experiences, fine motor skills, shapes, and more. 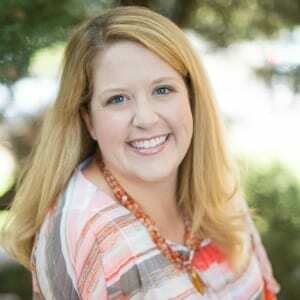 Go ahead… Ditch the worksheets! 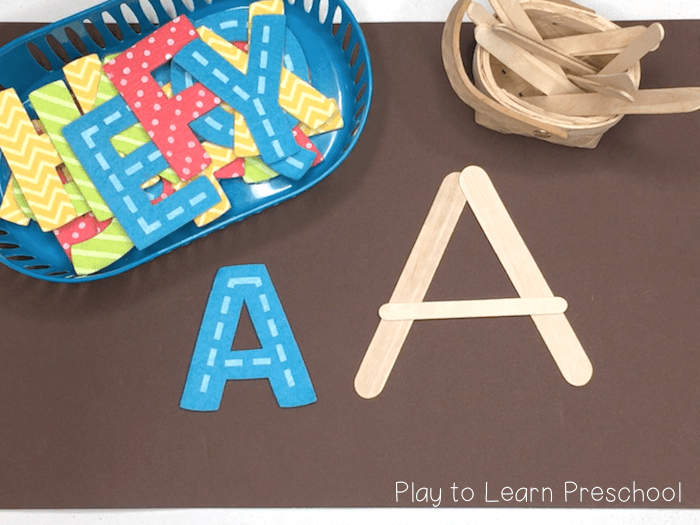 Here are 10 hands-on ways to teach the alphabet without a pencil and paper worksheet. Children choose a letter and then arrange the craft sticks to make the shape of it. Print these cube letter templates. Children use the cube letter templates as a guide while they build the letter out of cubes. Small, shallow tray or plate filled with sand. We like to use colored play sand, but you can use any type of sand, salt, or flour. Children choose a letter coin. 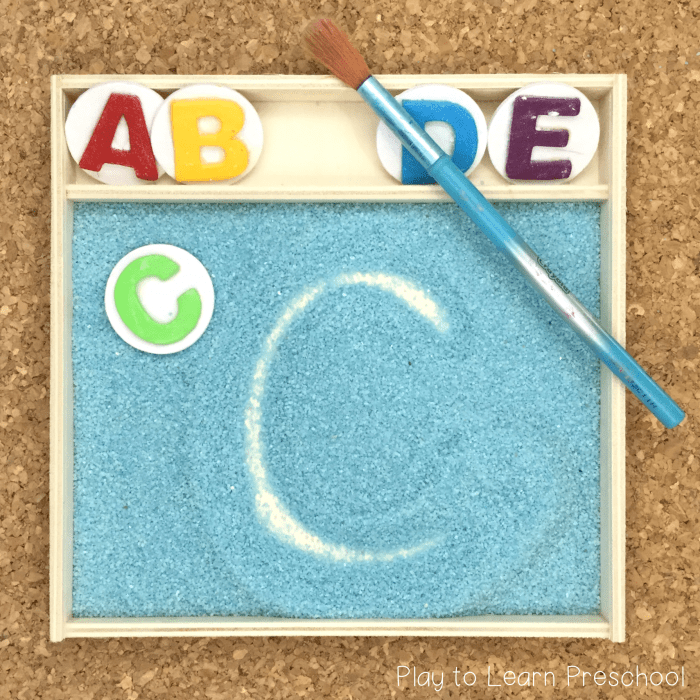 They use the paint brush to draw the letter in the sand tray. When they are finished, they gently shake the tray or pat the sand to smooth it out. Print these Fine Motor Dot Alphabet pages in upper case or lower case. Cup of small pom-poms, bingo markers, glass beads, or similar round manipulative. Tweezers, tongs, or a spoon. 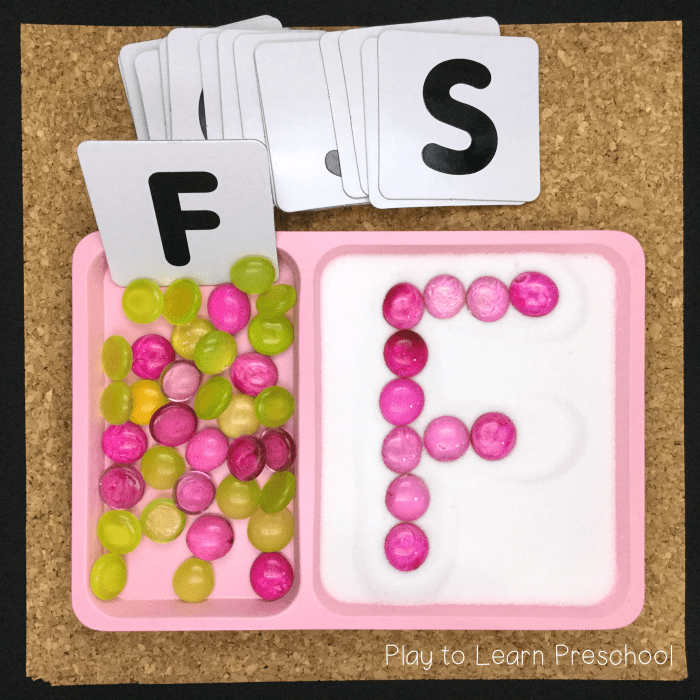 Children use their fine motor skills to transfer the manipulatives onto the dots to create each letter. Encourage the students to say the name of the letter, make its sound, and name the picture that begins with that letter. 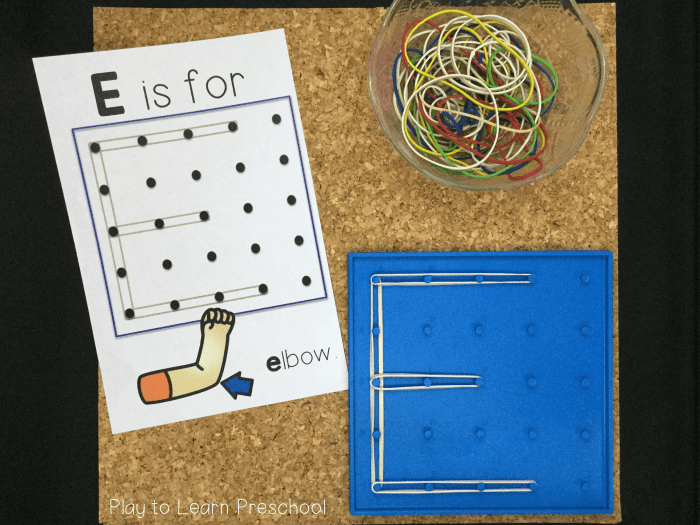 Using the templates as a guide, students stretch rubber bands around the pegs of the geoboard to create each letter. Children choose a letter card. They trace the letter in the salt with their fingers, then place the pebbles onto the shape of the letter. Print these Alphabet Clip Cards. There are 5 sets — pick the one that is best for your students. 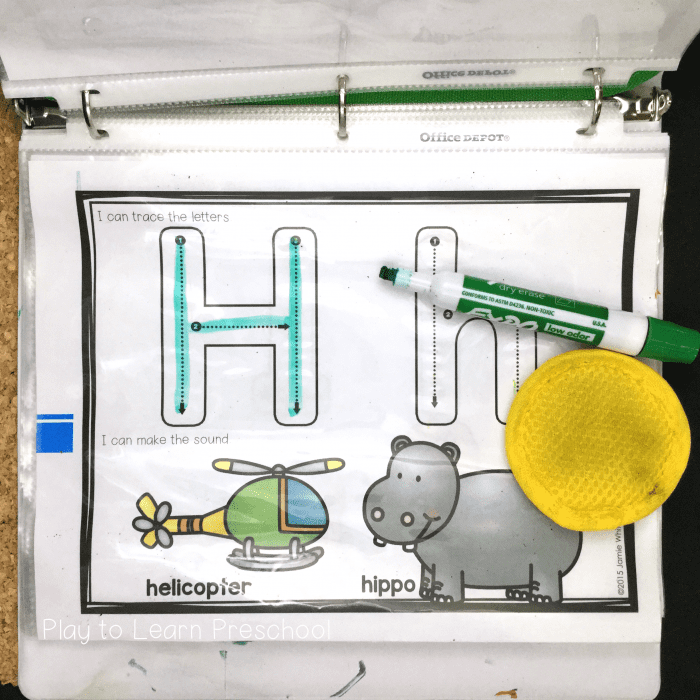 Print these Write & Wipe Alphabet pages. Insert each page into a plastic page protector. Assemble the pages into a binder. Add a pencil pouch with a dry erase marker, and a round make-up remover cloth. Students can practice writing the letters and re-writing them with this dry erase binder. Click HERE to see more pictures. 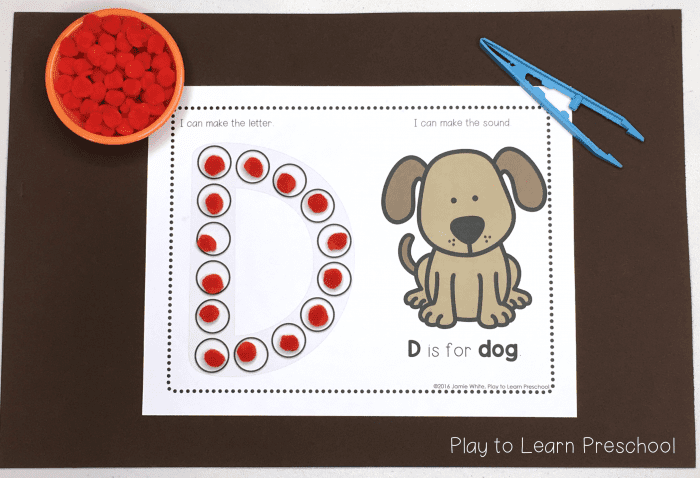 Young learners can choose a magnetic letter, then use the buttons to make the letter to match. Magnetic letter shapes or other thick letters. Press the letter shape into the sand to make an imprint. 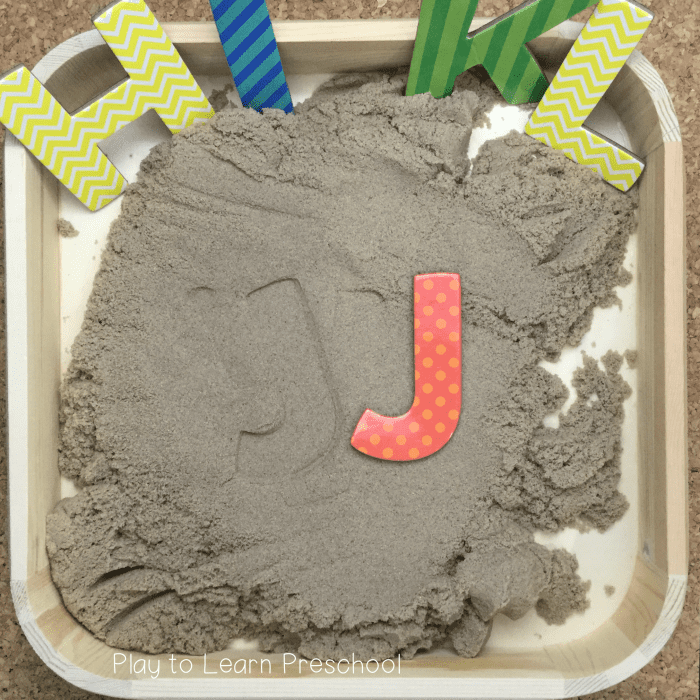 Use a writing tool (craft stick, pencil, or paint brush) to trace the letter into the sand. Not only are these options more developmentally appropriate for our youngest learners, they are more attractive and fun for them too. 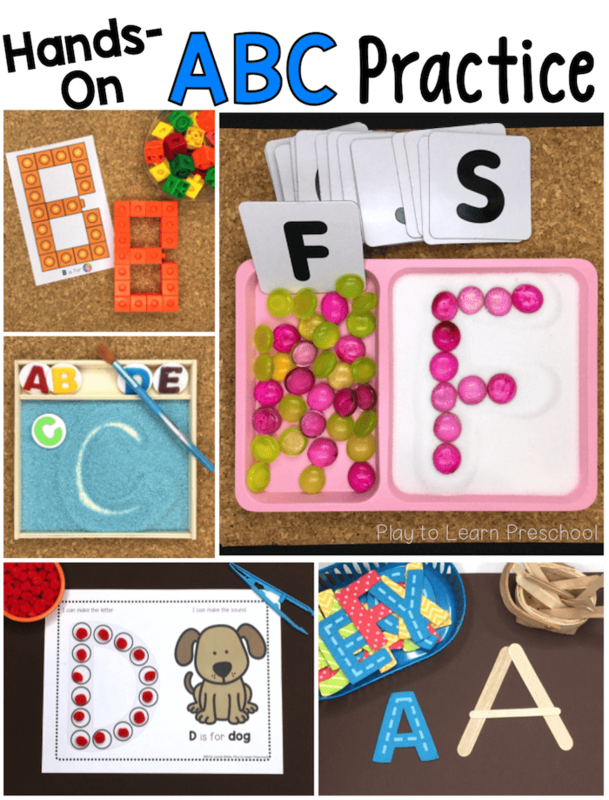 Experiment with creative ways to give your children the alphabet practice that they need, while also meeting their attention spans, sensory needs, and interest levels. Have fun learning letters! 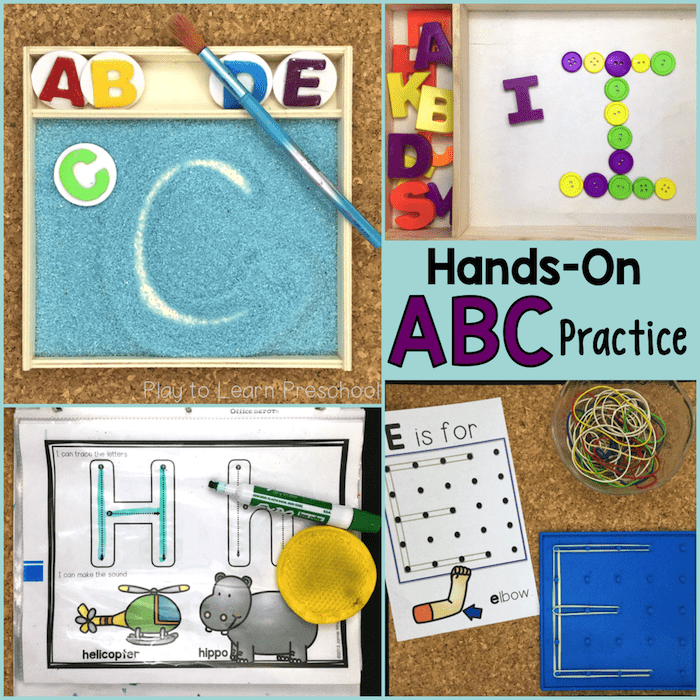 Watch our Facebook Live Video with more ideas for Hands-On Alphabet Practice HERE! Where did you get your letters that you used for the model with the craft sticks? They are really cute! Thanks for all the great ideas! They are from the Target dollar spot. 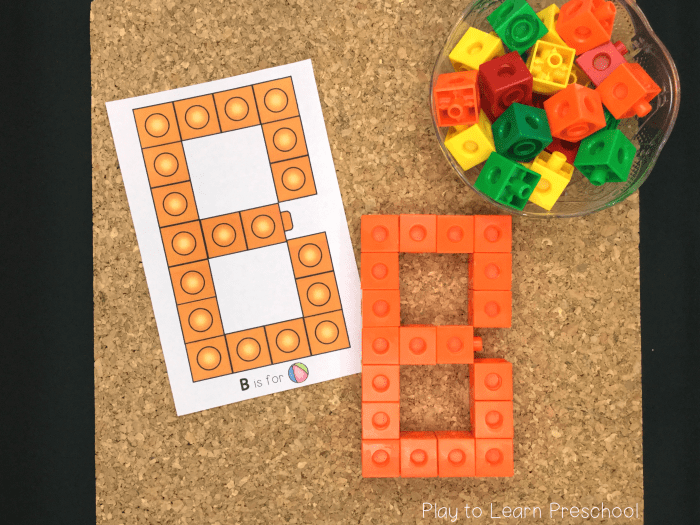 Any letters (magnetic letters, letter tiles, letter flash cards) would work for this activity! These are super ideas. Can you please email this to me. I want price list of the items.i have a preschool. Please share details price of this product.. Need urgently. Where did you get the divided tray so there is a spot to put letters and a spot for the sand or salt? From the Target dollar spot. It had wooden beads and laces in it. Love these!!! Want to have for my grandson’!